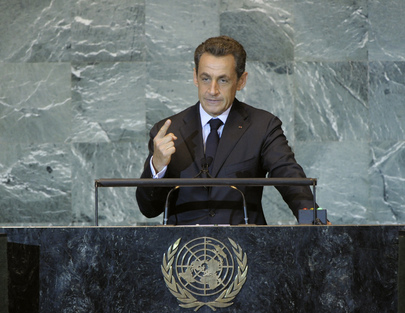 NICOLAS SARKOZY, President of France, wondered who among those gathered at the General Assembly one year ago could have imagined that the world — already convulsed by an unprecedented economic crisis — would have undergone such changes. In just a few months, the “Arab Spring” had given rise to extraordinary hope. For too long, the Arab peoples were oppressed. They had now opposed those who proclaimed that the Arab-Muslim world was by nature hostile to democracy and human rights. “We do not have the right to disappoint their hopes,” he stressed, adding that breaking those dreams would “vindicate the fanatics”. The international community could not respond to the aspiration for democracy by perpetuating the tragedy of the Israel-Palestine conflict. In that regard, new methods should be adopted where others had failed. It was time to stop believing that a single country or group of countries would resolve so complex a problem; too many crucial players had been sidelined for those efforts to succeed. A collective approach was now indispensable to create trust and offer guarantees to each of the parties. The peace would be built by the Israelis and the Palestinians and by no one else; no one could impose peace upon them, but they must help. In that regard, by setting preconditions for negotiations, “we doom ourselves to failure”, he said. “Let us cease endless debates on the parameters” and begin negotiations with an ambitious timetable, he said, calling in particular for the parties to take one month to resume discussions, six months to reach agreement on borders and security and one year to reach a “definitive agreement”. France also proposed to hold a donors conference to assist the Palestinians in completing the construction of their future State. “We should not look for a perfect solution, because there are no perfect solutions,” he said. Instead, the path of compromise should be embraced. The Palestinians had been waiting for a State for more than 60 years, and meanwhile, Israel had been denied the right to live in peace. The question of peaceful coexistence of the two peoples had continued to fester. Who did not see that a democratic, viable and peaceful Palestinian State would be, for Israel, the best guarantee of security? In that vein, any threats made against a Member State of the United Nations were unacceptable. Should such threats be made, France would immediately and wholeheartedly stand beside Israel. Member States today faced a choice, he said. Everyone knew that Palestine could not immediately obtain full and complete recognition of the status of a United Nations Member State. However, a veto in the Security Council risked engendering a cycle of violence in the Middle East. “Let us not be diplomats for a day,” he told delegates, urging them not to exclude an intermediate stage in the conflict’s resolution, which would offer Palestine the status of a United Nations observer State. The ultimate goal must be the mutual recognition of two nation States for two peoples, established on the basis of the 1967 lines, with agreed and equivalent exchanges of land. “Each [party] must make efforts to understand each other’s reasons, their sufferings and their fears,” he stressed. It was time for them to build peace for their children. Both Israeli and Palestinian mothers felt the same pain for the death of their children. At the same time, the United Nations should take the opportunity to “wake the Arab people up to the service of democracy”. A compromise solution would rebuild trust and give people hope. “We must not miss this appointment with history”; the solution was on the table, he concluded.